The new for 2017 HC2500 chute is a game changer. The updated chassis is tough and incorporates favorite features from the latest engineering efforts. The standard model of the 2500 series chutes includes a Hydraulically actuated headgate, center squeeze, and tailgate. All of these components utilize the enhancement of a rack and pinion gearset. The standard model comes standard with neck extenders on the headgate and durable urethane yokes to further limit head movement. 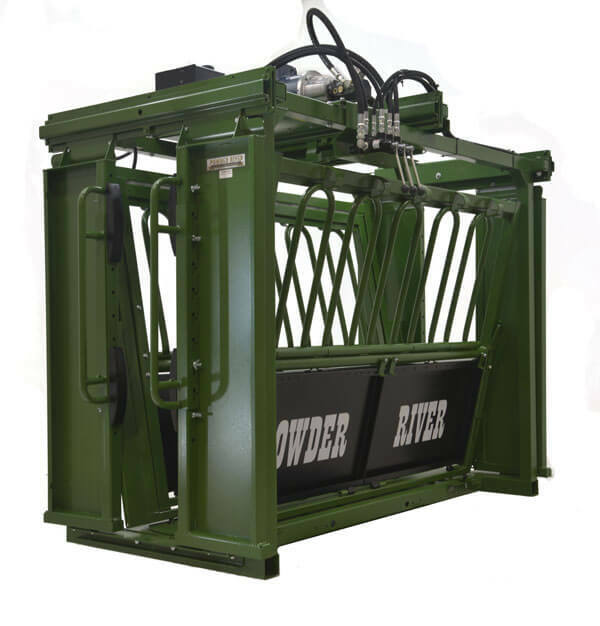 The 2500 series incorporates the toughest tailgate built by Powder River. It is fast and great at traffic control at the back of the chute. 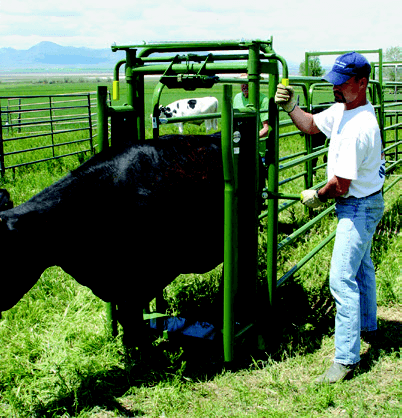 Utilizing the rack and pinion on the center squeeze ensures an equal and secure catch on the cattle to calm them and keep them still during whatever procedures you have planned. The large kick pans offer great underneath access, and the drop fingers along the side of the squeeze give great access anywhere along the side of the animal you need to brand, inject, inspect, or maybe just deliver a few reassuring pats. The drop fingers are the same smooth slam latch closure that Powder River chutes are famous for. The width of the chute floor is adjustable with the provided lever bar. A pair of specialized plates on the floor make this adjustment simple and easy. The 2500 series of chutes incorporates an upgraded motor and pump set over the 2000 series. This motor and pump set comes wired for 220v operation. The new for 2017 HC2500 chute is a game changer. The updated chassis is tough and incorporates favorite features from the latest engineering efforts.